reviews, interviews and news focusing on many types of music, mostly rock, with the primary emphasis on progressive rock. a historic minneapolis music club, first begun in 1970 as 'the depot'. it seats 650 people. the 7th street entry was founded in 1981. the 7th street entry has offered local bands, and some lesser known national acts, a 250 person room to really build themselves up in the minneapolis scene. displays paintings and photographs of a trip to the music centers of beale street in memphis and to bourbon street in the french quarter of new orleans. also has links to her many other painting sites. The Australian street performers network web site featuring, the Oz street directory, buskers news and archives, and gallery and service information. Walnut Street Theatre - 111 West Walnut Street in Bolivar. Information about upcoming productions, show times, and map. Auditions open to all ages. Trio from Italy performing a mixture of chamber music, rock, tango, and street music. Gallery of street art, excerpt from a roundtable discussion on street art, and essays. Illusions, escapes, and how to be a street magician. Street magic, conventions and trade shows. Made by and for buskers and street performers. A reference site for the sport of the performing street arts. a virtual visit to the oldest continuously inhabited street in america with its original houses, from hudson valley network. 'Its a brutal video depiction of street life, portrayed through rapid-cut, hand-held camera images'. Performs in the Riverfront Theatre in Milford and produces shows year-round including musicals, drama, comedies, original works as well as the Street Kids Summer Camp. Street magic tips and tricks, videos, how-to guide and supplies for street magicians. Related articles. Amens street team, news, tourdates, competitions, free downloads to help the band. host dave samson serves up blues 'from beale street to pike street, from austin to boston' saturday night 10pm-1am on kbcs-fm 91.3 in bellevue/seattle, washington. available online via webcast. Art, news, previews and reviews about Street Angel, a kung fu, skateboard action heroine comic book by Jim Rugg and Brian Maruca. A group blog for fans of Shortland Street. review of the novel perdido street station by china miÃƒÆ’Ã‚Â©ville. handsomely decorated street organ is reportedly the last extant in the maltese islands. owner mari van rooy offers musical street entertainment for hire. history of the instrument, photos, video [avi format]. named after a brooklyn street, this site is the work of esa nickle who aims to showcase various peoples work in visual art, writing, resource links and some insights into esas world. three piece group specializing in klezmer and jewish music. features show schedule, photos, description of klezmer music, and jewish related links. Biography and tour photos of the artists from their Eighteenth Street Lounge label. Reviews the partnership of the two nations in creating this version of Sesame Street, in order to teach the new generation civilty. news, biography, music clips, and pictures. Album review of 'Live: The 1971 Tour' CD. Character information, series details, fan works, music, games, manga summary, and links. If the business hours of music street journal in may vary on holidays like Valentine’s Day, Washington’s Birthday, St. Patrick’s Day, Easter, Easter eve and Mother’s day. We display standard opening hours and price ranges in our profile site. We recommend to check out musicstreetjournal.com/ for further information. 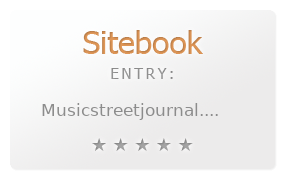 You can also search for Alternatives for musicstreetjournal.com/ on our Review Site Sitebook.org All trademarks are the property of their respective owners. If we should delete this entry, please send us a short E-Mail.